Case studies apply theory to practice. When approaching a case study assignment, focus on relating information from the literature to the main issues in the case. A case study narrows the focus to a particular organisation, or a specific sector, with definite needs and issues. By focusing on the IT environment of one business you can concentrate on applying your knowledge and analysis to issues in the particular case and then support your ideas with relevant evidence from the literature. Your lecturer expects you to demonstrate your skills in order to analyse the case study, apply the relevant theories and communicate your reasoning in the required format. Why do we use real cases and where do cases come from? Case study assignments involve a response to real life situations, since working with real problems is crucial for future IT professionals. The case at the centre of the assignment may have been formulated by the lecturer or taken from the real world. Cases formulated by the lecturer replicate real experience as closely as possible. Deloitte website offers several real world cases of innovation in information technology. How do I analyse the case study? Always check assignment requirements to make sure you understand what is expected of you for a case study. Case study based assignments are written in either a report or essay format (check this in your assignment requirements). The aims of the writing are typically to identify the major problems/issues that exist, to apply relevant theories, and in some assignments, to suggest potential solutions to these problems/issues. What issues/problems emerge from this case? What does this mean for this case? How can models be applied to this case? What theories are relevant to this case? What realistic solutions can solve the problems in this case? How might solutions be implemented in this case? 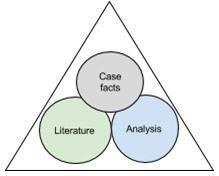 One of the most challenging tasks in writing the case study is to connect the theory to your analysis and also to the case facts. There is an interrelationship between the case information, your analysis of the case, and the literature/theories from your course. It is important to weave together these three elements in your assignment response so that theory is integrated with practice. At MoneyTrust, the high level IT maintenance practices that were previously managed internally were assigned to the company providing the Cloud software. Not all security features were installed for casual staff many security features were overwritten during updates made by the external company responsible for making updates in the Cloud. Treloar (2012) suggests applying more stringent security strategies, especially those related to passwords and software updates; for example, ensuring all security features for all users are reviewed for each software update in the Cloud. It is important to find, select and evaluate quality academic sources in your assignment.